The story of Kong has endured for centuries-from the time of the Vikings to turn of the century England. Now, journey deep into Skull Island with two new stories that take a captivating look at one of the greatest monsters in history. Discover the beauty and fury of the mythic Kong sanctuary in this collection featuring work from Eisner Award nominee Phillip Kennedy Johnson (Jim Henson's Power of the Dark Crystal) and writer Paul Allor (Teenage Mutant Ninja Turtles) with stunning art by rising star Chad Lewis (Planet of the Apes Visionaries) and critically acclaimed illustrator Carlos Magno (Kong on the Planet of the Apes). 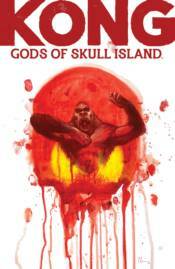 Collects the Kong: Gods of Skull Island #1 and the Kong of Skull Island 2018 Special.